Magrath and District Citizen of the Year Award to be presented to the individual age 18 or better recognized as giving unselfishly to our vibrant community. Magrath and District Youth of the Year Award to be presented to an individual under age 18 demonstrating outstanding leadership and volunteer spirit. 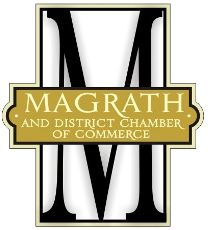 Magrath and District Business of the Year Award to be presented to the business or organization within our community deemed exceptional. Anyone can nominate: Your nominees can be anyone: yourself, a business or club, a parent, a teacher, a respected member of the clergy, a local business person or community leader - you make the choice. Nominations will be accepted from anyone in our community - including Magrath, Welling, Spring Coulee, Del Bonita - and can either be emailed to vote@magrathchamber.com, sent via our handy CYB Nomination form or even just mailed to: Magrath and District Chamber of Commerce Society CYB Nomination c/o Box 152 Magrath, AB T0K 1J0. Nominations must be received before our nomination cutoff at end of Hometown Christmas. Chamber members vote: In December, Chamber Members will vote the Citizen, Youth, and Business of the Year from nominations received. Traditionally our Citizen and Youth of the Year serve as Honorary Parade Marshall(s) in the Magrath Town Celebrations ('24th of July' Parade). We present and honour our CYB of the Year selections in our Chamber Gala Awards dinner early in the new year.